Wallace Edwin Marshall was born on August 1956 in St. Frances Hospital in Lynwood, California the son of Robert & Doris Marshall. His family moved from Camden, Arkansas to Garland, Texas in 1959. "My parents bought a home on East Vista in east Garland- then a year or so later moved to 833 Maple just north of the pickle factory on Walnut Street," Wally recalls. His nick name is "Wally" although his close friends could name him a few more. Wally attended daycare school at Grundler's Country Collage on Plano Road until he enrolled in B.H. Freeman elementary first grade at the age of 6. In 1963, His parents had bought a newer home at 2117 Frances across from the Hospital off Walnut when Wally was in the 2nd grade. Wally remembers the day that JFK was killed in Dallas, Texas in 1963 and all the kids in the school were called to the cafeteria. Mrs. Sewell and Jess Propher, the principal, told us about it and we all made a poster for our President! 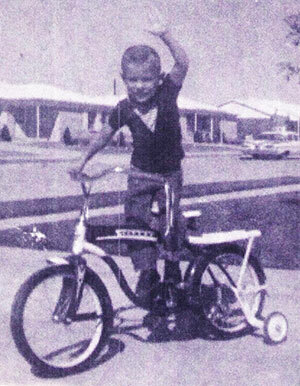 Wally could hardly wait until his parents got home from work everyday to take him to practice or to a game. He played baseball during the Summers at North Garland Little League before moving to Garner Little League when it was a brand new ball park. Wally played for Garland Fence coached by Billy Rosenbaum and his dad Robert. Wally remembers his teammates on Garland Fence, Gary and Larry Hart , Freddie Hall , Herman Erwin, Sammy Woods, Scott Rosenbaum, to name a few. "Those were the days!!! ", Wally recalls. Garner All Stars went to the regional and Mark Miller pitched and Wally Marshall caught a perfect game 5-0 at the age of 11 against Carrollton ,Texas. Wally played basketball and football for the Freeman Tornado's in the 5th and 6th grade. His coaches were Mr.Boyer, MJ Phelps. Wally remembers being the "Defensive player of the week" on the football team in 6th grade. After grade school it was Bussey Jr. High on Travis st. 7th, 8th and 9th grades, Wally played football and basketball for the Bussey Owlets and his team in basketball won the city championship both 8th and 9th grades under best coach ever for young kids Joe Garcia! Wally's team mates were Mark Miller, Bill Hubbard , George Alexander, Keith Vaughan , Jack Rhine, David Huddleston to name a few!! During the 9th grade Wally was approached by a coach that was recruiting players to attend the new North Garland High School that was being built on Buckingham Road. Wally had already signed up for Garland High and was raised up to be a Garland Owl and wanted to attend GHS, it was so tempting and changed his mind two days before the 1971 school year to attend NGHS. During his Sophomore year, Wally's baseball coach was Bill Verble. Baseball was always Wally's favorite sport but he also played Basketball for Leon Kennedy. The only problem there was no three point shot yet and basketball ran over into baseball season. Leon knew not to put Wally in the game that he would shoot the ball from half court. Wally's junior year in high school Coach Chuck Cornett was transferred from Bussey Jr. High to coach baseball at NGHS. Chuck was a major league baseball catcher for the Boston Red Sox and that was Wally's position. Wally played catcher all of his life so having a major league coach was great! Chuck taught him a lot of things about being a catcher. Wally thought Coach Cornett hung the moon or held the latter for the one who did! Wally broke his thumb during practice and missed half of the baseball season but still made Honorable Mention his junior year. 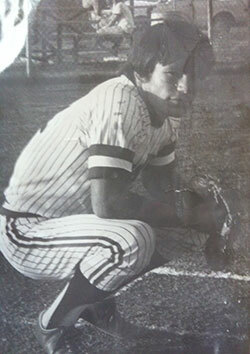 In 1974 his Senior year in baseball Wally was picked for the 6-3A All District catcher for the NGHS Raiders. Wally's number one fan was Clyde Vaughan, the custodian at NGHS. He never missed a home game. In the summer of 1973 &1974 Wally played baseball for the McKinney Mavericks coached by Al Alford. Al Alford was a high school baseball umpire and drafted Mark Miller, Steve Himmelreich, Chuck Cantlin and Wally to play summer baseball for the Mavericks Connie Mack league!! During the state championship game against Kips in Dallas Mark Miller and Wally was approached by a collage coach Bob Leach from Bee County Junior collage in Beeville,Tx. A couple of days before going off to collage to Beeville, Wally injured his leg on a Carnival ride accident at the Jaycees Jubilee at Central Park with his high school girlfriend Valerie Erwin. It was months before he could get on the baseball field! Mark Miller and Wally were room mates in collage too. Wally was raised up in the same neighborhood with Mark since the second grade. Well after a short collage stint , Wally finally realized he would never be a major league catcher, the pro scouts said, "Son, we gottem like you a dime a dozen", so Wally packed his bags, left collage and went to work as a plumber's helper for Texas Instruments learning to be a pipe fitter. It was during this time he moved out of the house. During this period of 1977 Wally started a DJ business "The King of Disco" spinning Disco records and playing at all of the High School Dances during the Disco era until 1981. The schools where actually fighting over Wally to get him to play at their schools for the victory dances, Wally said he was the only guy in Garland with a new Ford truck, Bass Boat and a rent house at 19 years old. Wally left TI and went to work for Joel Wilson and Charlie Ball who were partners in owned a plumbing company in Garland at that time. 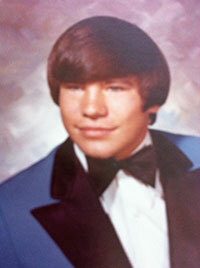 Wally married in 1983, started a family and at that time worked as a plumbing contractor for Proctor and Gamble. Wally's daughter, Lesli Kirsten Marshall, born October 14, 1984 and now 29 and lives in Austin, Texas. Lesli graduated from North Texas University with an art degree and doing very well in the world of art. Wally eventually owned his own plumbing company until he received a phone call from T.D Peacock from the Garland School District to come to work there as the master plumber for the district in 1985. For the next, 17 years Wally served as the master plumber and plumbing superintendent under his boss you guessed it, Chuck Cornett his ole baseball coach from North Garland High. Wally remembered one cold and freezing night , he had just went to bed when the phone rang. "This is Chuck. Are you asleep? We have a water main leak at one of the middle schools Brandenburg way across town." So Wally jumped up, went to the shop, drove the back hoe over to the school and dug up the leaking pipe. By that time Chuck had gotten there and Wally was down in the hole he had dug out around the leaking pipe. Wally looked up at his high school baseball coach that was now his boss and said "You know Chuck, I guess I should have continued on in collage and got my degree so I wouldn't be down here in this ditch." Chuck's response was, "I have Masters Degree and I'm standing on the side of the ditch with you." He added, "What would you have done different if you had a scholarship? You like the outdoors, Hunting and Fishing all the time and you would never be caught wearing a Tie or setting in a office!" Wally didn't feel too bad after all not having a sheep skin because he wasn't going to give up Hunting or fishing any time soon! While working at the school district, Wally had only two bad habits: Bird Hunting and Crappie Fishing! Wally always had a kennel of good bird dogs if you liked to hunt quail. Over the years some of the Garland coaches and superintendents hunted with Wally. Quail hunting was his passion but Crappie fishing was Wally's Dream!! In 1979 when Wally was plumbing for Charlie and Joel, at the plumbing supply house there was Jack Caldwell. Jack loved fishing and had invited Wally to go crappie fishing at Lake Lavon. After that trip with Jack in 1982, Wally was hooked on crappie fishing! Wally bought a house at 832 Nash in Garland. His neighbor was a crappie fishing machine. Truel Peacock, who at the time worked for the City of Garland Street Department, invited Wally to go to Lake Tawakoni to wade fish for crappie. Truel taught Wally how to jig fish for crappie for the first time! After a couple of years had passed, Wally was still fishing as much as possible and hunting every weekend. In 1997 Wally heard about a Crappie Tournament that was coming to Cedar Creek lake in east Texas. He had never fished a tournament before but was looking into it seriously, so he asked fellow worker at the school district- Joel Peacock Truel's brother- to fish the tournament with him. Joel was leery and never fished the lake before so Wally went down to pre-fish for the event and found fish located in some cat tails. Perfect! That was wade fishing at it's finest! That day of the tournament, Joel and Wally won the very first crappie tournament and not knowing much about tournaments they had set the world on fire, at least it set Wally on fire. After the tournament Wally was approached by a tackle rep Jimmy Cunningham , Jimmy was the rep for many crappie fishing products at that time and wanted to know if Wally would like to represent his companies to promote crappie fishing and products ! Wally said of coarse he would, there has never been a professional crappie angler. Wally started promoting crappie fishing and products that Jimmy represented. The summer of 1997 Wally went to the American Sports Association's fishing show in Las Vegas. This is where all of the manufactures that build fishing tackle has a trade show to show all of the products they make. Wally didn't have but 400 dollars to his name after plane tickets, so a friend let him sleep in the camper he had on his truck because Wally couldn't afford a motel room- it was Hot in Vegas!! Wally walked about a mile down the road to the Las Vegas Hilton convention center every day to the show- talking to the companies about sponsoring him because Wally wanted to be a professional angler! After walking and talking for two days at the ASA show, Wally headed back to Garland, Texas rejected with no affiliates. He said everyone would tell you what you wanted to hear so they could get you out of their booth, so he was guessing. Then one day the phone rang and it was Joe Hall who owned Blakemore Lure Company out of Branson, Mo, one of the companies Wally had spoken too. Joe Hall told Wally that there was something about him that caught his eye and to call Wally and work out a affiliateship for Wally to promote his lure "The Blakemore Road Runner". Wow! Wally was so happy to get his first affiliateship! The contract was 12 dozen Blakemore Road Runners. He remembers getting the lures in the mail and putting them in his tackle box one at a time. Over the next few years Wally was conducting seminars at the Dallas Boat Shows and Barlow's tackle in Richardson, Texas. He started traveling across the state talking crappie fishing to whoever was listening, from one seminar to the next. In 1989 Wally landed his first boat sponsor , Ranger Boats in Flippin, Arkansas. Forrest Woods said they had never heard of a professional crappie angler- and as it was- neither had Wally! Wally then started traveling even more, doing more seminars for Blakemore and Ranger Boats across the country. In 1989 he started Pro Crappie Guide service because everyone Wally met wanted him to take them crappie fishing. So for several years Wally guided for crappie in North Texas on most of the lakes and some bar ditches here and there. Working at the school district and guiding a little on the side helped him to make ends meet. Well by 1992, Wally's affiliates had enough confidence in him doing seminars that they invited him to do some seminars at the World's Fishing Fair in Springfield, Mo. at the one and only Bass Pro Shops®. The seminars at the Worlds Fishing Fair was a Grand Slam for Wally. That weekend Wally sold over 400 cards of Blakemore Road Runners for Blakemore Lure Company. Joe Hall made the comment, "I think we are on to something here." 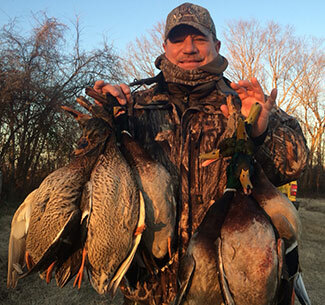 For the next 4 years Wally continued promoting seminars and being a guest on outdoor shows like Jimmy Houston Outdoors and Barry Stokes outdoor trails TV. By this time Wally had won several major crappie tournaments across the country and was considered one of the top crappie anglers in the country. In 1992 Wally met a new fishing partner, Jeff Heuman from Pilot Point, Texas to fish crappie tournaments with on the creek banks of Lake Texhoma. Wally and Jeff started winning more crappie tournaments and traveling over one million miles chasing crappie and are still fishing partners today! Also in the fall of 1992, Wally moved to 2102 Peggy ln. and purchased the home of the late Mrs. Nicholson that owned the Nicholson Five and Dime on the down town square in Garland . In the fall of 1996 Wally received a phone call from Bass Pro Shops® in Springfield, Mo. to design crappie rods under the Wally Marshall™ name. During the first call Wally told them no, that he wasn't interested. But when the GM of Fishing , Lynn Reeves from Bass Pro Shops® called back to double check, Wally said YES! In 1997 Wally Marshall™ Signature Series crappie rods were in the Bass Pro Shops® catalog and the one store they had in Springfield, Mo. In years to come more products were designed by Wally and Bass Pro was building them as fast as they could to keep up with the demand for Wally Marshall™ Signature Series products. Wally had come up with the idea of getting a trademark for Mr.Crappie®. 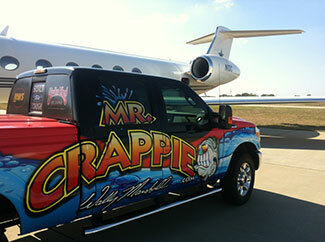 Mr.Crappie® seemed like a great name for his products. Over the years people had called Wally " The Crappie King", "The Crappie Guru", etc. Mr.Crappie® is one that stuck in Wally's mind. So in 1998 Mr.Crappie® fishing line was invented and sold exclusively at Bass Pro Shops®. Wally Marshall™ designed rods, reels, lures, hooks, floats, line and almost everything you would need to catch or clean a crappie! 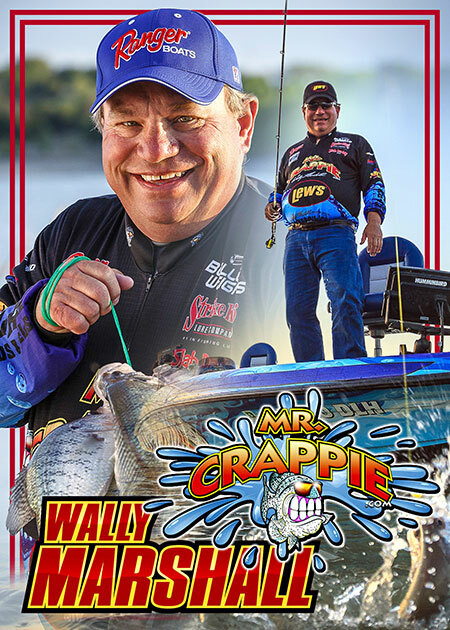 From 1996 to 2011, Wally Marshall™ has designed the most awesome crappie fishing products for crappie anglers all across the US- and Overseas too! In 2002, Wally said he woke up in the middle of the night thinking about his job for the first time in 17 years. He tossed and turned and then finally decided that today would be the last day working at the School District. So Wally got up and went to work- checking in with Chuck Corbett, his Boss, just like every other day of the week. Chuck said, "Wally I need you to go over to South Garland and check on a water leak this morning." Wally looked at Chuck and replied, "Chuck, not today. Today is my last day at the School District." Chuck leaned back in his chair and asked, "Is there something wrong? If there is, please take the day off and straighten it out." Wally's reply was, "Chuck, I can't chase my dreams here working 7 to 4 everyday." Wally spoke briefly with his crew telling them the news. "You're leaving after 17 years? ", they asked. "Yes", Wally replied before he walked out sawing off the limb behind him. One employee asked Wally on the way out, "What if it don't work out, where your going?" Wally's answered, "If it doesn't work out it won't be because I didn't try." Wally said when he walked out of that building a big rock fell off his shoulders and it's still rolling downhill! So, from 2002 until 2011, the rock that fell off his shoulders is still rolling! Wally Marshall™ sawed that limb off again just a few years ago by walking away from a very lucrative contract with Bass Pro Shops® exclusive rod and reel contract. He wanted to sell his products all over the world and design new and better products for crappie anglers across the US and still work hard selling products at Bass Pro Shops. Brand new for 2012, Wally Marshall™ "Tuxedo Black" Signature Series by Lew's® and Mr.Crappie® products will be available this fall to the all of the stores across our great nation that sell fishing products. Once again teaming up Lynn Reeves and Wally Marshall™, Lynn reeves was instrumental in Wally Marshall™ Signature Series back in 1997 when he was the GM of fishing at Bass Pro Shops®. Over the past ten years, Wally has put on the largest family fishing tournament called the Big Crappie Classic. It brings family together to fish in a tournament atmosphere- kids and parents together weighing their catch and spending quality time together in the outdoors. Wally has donated his time taking the Buckner's orphanage kids fishing and special request to take kids out for a day of fishing that have special needs. Wally has donated annually to the Dallas Woods and Water Club for many years. Breast Cancer- Susan Coleman Foundation, Relay for Life, Uncle Jesse's at Pat Mayes Lake tournament for kids Powderly, Texas. Wally also affiliates the Garland Crime Watch and Garland Police Mad Dog Moore fishing tournament every year and many more tournaments across the country that has to do with taking KIDS Fishing. Kids are our future and the future belongs to our KIDS! Wally's affiliates over the years have played a big roll in the success of Wally Marshall's career and dreams. Ford Motor Company since 2003, Blakemore Lure Company since 1987, almost 25 Years is unheard of in the tackle industry! TTI Companies since 2005, Tempress marine seating since 2001, Betts Tackle since 2006, Bullet Weights since 2009 , Nitro Boats since 2002, Costa since 1998, and Bass Pro Shops® since 1997 . Wally would like to extend a sincere appreciation to all of his affiliates that helped make his dreams come true. Quote from Joe Hall founder of Blakemore Lure Company: "Wally you are what the fishing industry needs more of. Someone who truly has the passion for fishing and not just a job. Thanks for all you have done for Blakemore Lure Company over the last 25 years." Quotes from Wally Marshall™: " "The harder I work, the luckier I get", "What ever it takes!" , "Your persistence pays off", "I would rather die standing up than live on my knees", and "Surround yourself with good people and good friends like I have for 54 years, I have been living my dream!" A Special Thanks and "I Love You" to my mother Doris and John Tye and Lesli for your love and support. Also, I would like to thank all of my friends for hanging around for all of these years and we are going to hang together for many more years to come! Wally Marshall™ drives about 72,000 miles a year promoting crappie fishing in his New 2011 Ford 250 Super Duty that you can't miss in Garland,Texas, It's Mr.Crappie®!! Truman Lake - Clinton, Mo. Eufaula Lake - Eufaula, OK.